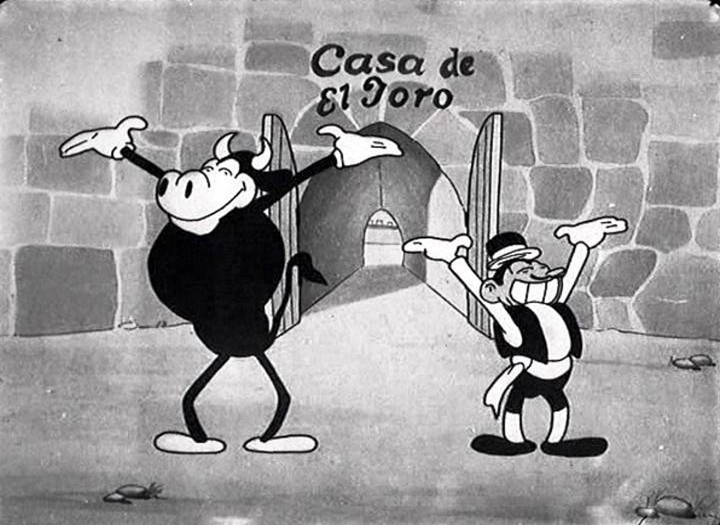 ‘El Terrible Toreador’ is the second entry of the Silly Symphonies. It has been far lesser known than the first, ‘The Skeleton Dance‘, which is no surprise, because it contains none of the ingredients which made ‘The Skeleton Dance’ a classic: there’s no interesting mood, no spectacular animation, and there are hardly any funny gags. Unlike the other early Silly Symphonies, ‘El Terrible Toreador’ is more silly than symphony-like. That is: it’s more of a ‘story’ consisting of silly gags than the song-and-dance-routine typical of the Silly Symphonies up to 1931. The cartoon consists of two parts: in the first part we watch a Spanish canteen, where a large officer and a toreador are fighting for the love of a waitress. In the second part, the toreador is fighting and dancing with a bull in the arena. Surprisingly, the story of the first part is hardly developed here: the cartoon ends when the toreador has pulled the bull inside out, thus ending the fight. ‘El Terrible Toreador’ is notable for being Disney’s first attempt at the human form since the early 1920s. However, the humans are a far cry from ‘Snow White and the Seven Dwarfs’ from (only) eight years later. In this early cartoon the human characters are extraordinarily flexible and they do not move lifelike at all (I noticed I thought of them as bugs some of the time). The most interesting feature of this short is Carl Stalling’s score. His music already bears his signature and contains many citations from ‘Carmen’ by Georges Bizet.